Shahn Majid looks at dark energy. 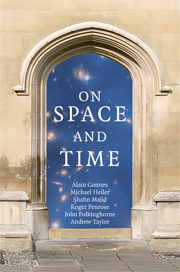 Will it herald a revolution in our understanding of fundamental physics? Last week I explained what I argue to be the greatest theoretical challenge facing fundamental physics today; that the very concept of the spacetime continuum is flawed and in need of revision. This week I want to explain what I think is the very greatest challenge coming from the experimental and observational side. Science thrives on a dialogue between theory and experiment and when you put all this together you arrive, as I see it, at the most exciting time for theoretical physics for a century, perhaps even since the 17th century in terms of the expected level of shake-up. The experiments and observations that I refer to do not relate to the Large Hardon Collider. While that should be interesting especially if they don’t find the Higgs particle … well the LHC is now broken for a few months and that gives us a chance to see what else is going on. What is going on is the possibility of testing physics at the Planck scale, i.e. at energies 10 million billion times greater than the LHC could ever produce. It’s a brand new field, hitherto considered by physicists completely impossible, called ‘quantum gravity phenomenology’. Don’t worry, we won’t actually be producing energies that high on Earth in the near future, we will be turning to cosmology. But the energies available if we knew quantum gravity could be rather high. If you watch the SciFi Channel series Stargate Atlantis, the portal device is powered by a ‘zero point module’ that taps into the vacuum energy of completely empty space. I think it was Arthur C. Clarke who first brought this into fiction, but it was based on theoretical ideas at the time. One can give a simplistic estimate of this vacuum energy based on cutting off particle wavelengths at the ‘minimum wavelength’ of 10³³ cm and the size of the Universe. I do this in On Space and Time and it comes out naively as about 1094 grams of mass-energy per cubic centimetre of empty space. To put this in perspective, this is about 1088 (i.e.10,000,000,000,000, 000,000,000,000,000,000,000,000,000,000,000,000,000,000,000,000,000,000,000,000,000,000,000,000,000) times the energy consumption of the world in a year, in each cubic centimetre! You can think roughly of a kind of ‘sea’ with the same density as Planck-scale quantum-black hole objects (as featured in my first post two weeks ago) perhaps making up the foam-like structure of spacetime which, at a distance, we see roughly as a continuum. But please don’t think take this too literally. This is more like a ‘sea’ of quantum fluctuations and may well be a theoretical artefact of the way we think about quantum mechanics. Now the funny thing is that astronomers in the last two decades have firmed up their picture of the Universe on a large scale and have exactly concluded the apparent existence of some kind of ‘vacuum energy’ uniformly filling out space. This has never been seen directly but is deduced from a careful look at the curvature and expansion rate of the Universe and the average energy density needed to explain it. As it has never been seen, it is called ‘dark energy’, but it seems to be there. So on the one hand theory is naively predicting a vacuum energy density throughout space of 1094 grams per cubic centimetre while astronomical observations are giving us an actual density of … er … 10-29 grams per cubic centimetre! So, the theory is wrong compared to experiment by a factor of 10123, i.e. 1 with 123 zeros after it! There is not even a name for such a big number. The fact that back-of-envelope theoretical estimates are so badly off from what is observed tells us that there is a lot going on that we do not even remotely understand. This is called the ‘problem of the cosmological constant’ or the ‘dark energy problem’ and is probably the greatest challenge for physics today. We just dont have a clue how to get the experimentally observed answer from any theory other than by ‘fine tuning’ or fudging the answer in an unexplained manner. Maybe, as some philosophers argue, there IS no explanation. But I rather think that it’s a signal of a pending revolution in physics. While on dark subjects, astronomers have also found that while their mysterious dark energy makes up about 70% of the mass density of the universe, a further some 25% is made up of equally unseen matter of a particle nature, called ‘dark matter’. 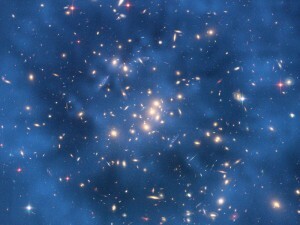 The image (see above; it is also the image used in the cover of the book) is a galactic cluster showing a fog of dark matter as deduced by astronomical observations and projected onto the image by a computer (you won’t actually see this dark matter if you look). You can read more about it here. Things are being discovered about dark matter all the time. But no one has a clue what it’s actually made of. Not even a dust of stable black-hole remnants seems to fit the bill as the density of such things from all currently known mechanisms, at any rate, is not high enough to account for 25% of the matter in the Universe. So, does all this worry you or does it excite you? Only 4-5% of the mass energy of the universe as deduced by astronomers from its gravitational effects, is explained by modern science! Some 70% is in some unexplained form of energy and some 25% in some unexplained form of matter. It should excite you as it means that that the world is actually as full of mystery and ripe for scientific revolution today as it was for Newton discovering gravity as an explanation of Kepler’s laws for planetary motion or as it was at the birth of quantum mechanics at the start of the last century. Meanwhile, if anyone tells you they are close to a ‘theory of everything’ you should be skeptical if they are not also close to addressing these mysteries.